The highlight of every academic year is UW ECE’s Graduation ceremony — we celebrate the years of hard work our students have put in, and we celebrate their incredibly bright futures. We invite all family and friends of graduating students to join us for this transition moment from student to engineer. 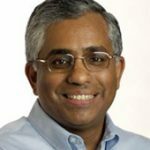 Our graduation speaker is Ganesh Moorthy, president and chief operating officer of Microchip Technology Inc. He has 19 years of experience with Intel, where he held engineering and management positions, including general manager of the 8/16/32 Microcontroller Division. Moorthy left Intel in August 2000 to become the CEO of Cybercilium, a small Tempe- based software start-up company. He joined Microchip as vice president on November 26, 2001. He earned his BSEE degree from the UW in 1981. Registration for the UW ECE Graduation will open in May 2019. Commencement is a separate event from the department’s graduation ceremony. To get your cap and gown, you must register for UW Commencement. To arrange parking for your family for UW ECE’s Graduation ceremony, you must work with Transportation Services through the Commencement website. The UW Commencement website has an excellent checklist to use as you prepare for your graduation and a more detailed list for our international students that are graduating. Attire — Cap and gown (“regalia”) are strongly recommended; if you choose not to wear regalia, business attire (buttoned shirts, shoes, et cetera) is required. Checking in — You will check in at the Hec Ed loading dock starting at 6 p.m. Once you have checked in, you cannot leave the venue! Plan accordingly. Tickets — Are not required for UW ECE Graduation. Photographs — Are welcome! We do ask that you remain in your seats and not approach the stage to take pictures, as we will have a professional photographer. The professional pictures will be available on the photographer’s website following the graduation ceremony. Parking must be arranged via the UW Commencement website. Disability Services — There will be volunteers/staff at the front doors who will provide directions and assist your guests with disability seating. Hec Ed is an arena, so there are plenty of wheelchair accessible seating areas. Strollers — Guests should ask volunteers/staff for directions to the appropriate seating area. Balloons — Balloons are not allowed in venue.